Max Design Awards are back yet again with their third edition. One of the best platforms in the country that recognizes and rewards budding fashion designers, is closing in on entries for 2016-17. The property created by Max Fashion gives pre-final and final year fashion design students the opportunity to showcase their talenent. Last year the competition attracted more than 200 entries over 40 design colleges across the country. We're sure that this year too, we'll see design colleges gearing up to showcase their best talent. This year, the jury will include fashion designers Priyadarshini Rao, Varun Bahl and Nachiket Barve along with Vasanth Kumar, the executive director at Max Fashion. Final year Fashion Design students from selected and or accredited fashion designing institutes of India. 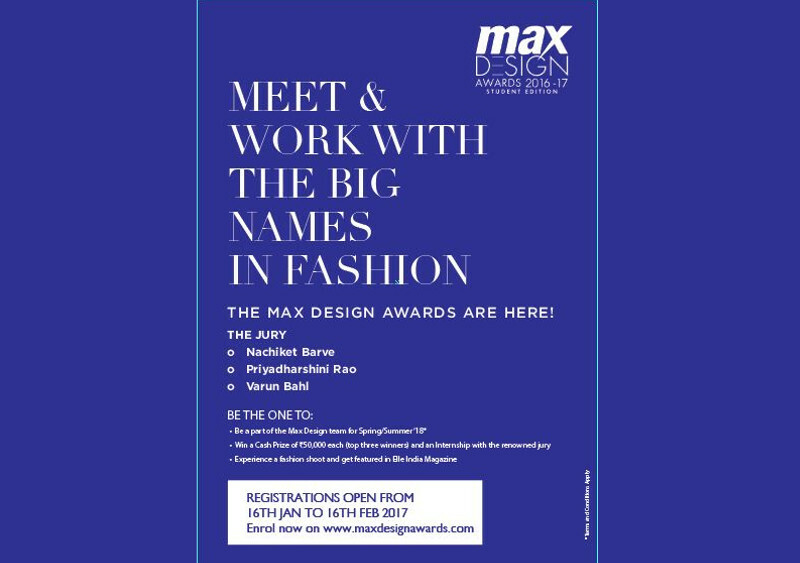 The theme for the Max Design Awards 2016-17 is "The Dark Side"
Step 1: Select any one category – Men's wear or Women's wear. Prepare a mood board of your interpretation of the main theme. Both sketches need to fall under any one category (men's wear or women's wear) selected by you. Send in your entries NOW!! !